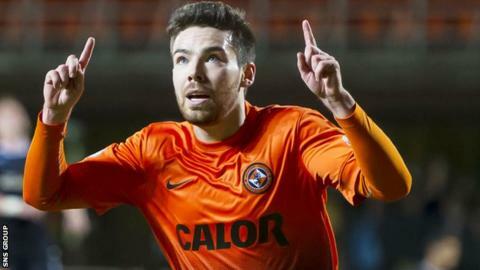 Dundee United midfielder Ryan Dow has agreed a new two-year contract extension at Tannadice. The 22-year-old joined from rivals Dundee in 2006 and has made 30 appearances for Jackie McNamara's side this season, scoring four goals. Goalkeeper Marc McCallum, 21, has also signed a deal until May 2016. "Ryan and Marc have both came through the ranks and in my time here both have shown continual improvement," manager McNamara told the club website. "Both are from the local area also and it will be a boost for our fans to see the players secure their future," he added. McCallum made his first team debut in a 3-1 home defeat to Aberdeen this month. United are preparing for Saturday's Scottish Cup final meeting with St Johnstone and Dow is in the frame for a starting place at Celtic Park. "Missing out on second and third in the league, it is a big opportunity to win a cup and the bonus on top of that is to get into Europe where we wanted to be," he said. "It is a big double, winning the cup and getting into Europe. "I have been playing more in the last six months, the gaffer has given me a run of games. "I like the style of football we play, I am happy, I am a local boy, so everything was in place to sign. "Some of the stuff we have played this year has been outstanding and to be involved in those games and performances - long may it continue. "Hopefully this team stays together. We have a really exciting team and we could go on to big things. "It is good playing attractive football and finishing in Europe but trophies are a hard thing to come by so if there is an opportunity to get one you are going to do everything possible to get one."